Shaking, or tremoring, is a natural response of the body to trauma, intense emotions and the activation of kundalini energy. Mammals after having near-death experiences will often shake for an hour to restore balance. Humans after surgery and children under extreme stress often tremble. Yet, this natural response is mostly repressed in adults. This may be why post traumatic stress disorder (PTSD) is prevalent among returning soldiers and survivors of natural disasters as well as other more common stressful life experiences such as accidents. Since trauma is an overwhelming experience which bypasses the conscious mind, effective methods for releasing trauma are often body-centered. Perhaps one of the most experienced people in helping large groups of people healing from trauma is Dr. David Berceli. He has taught his exercises that activate the tremoring response to over one-and-a-half million people all around the world. What he has found is that shaking-therapies are present in all cultures. When I learned of Dr. David Berceli’s work with trauma healing, I was very interested to find that it also involved shaking. In modern understanding, shaking accesses the brain stem where trauma is stored and where the body’s life support functions are governed. The shaking induces a parasympathetic nerve response, or “the relaxation response.” And it doesn’t matter much how the shaking is activated. In China, there is a 2,000-year-old healing tradition that activates the shaking response through flexing of the fingers and feet. The exercise is known as Waidangong or External Elixir Exercise. 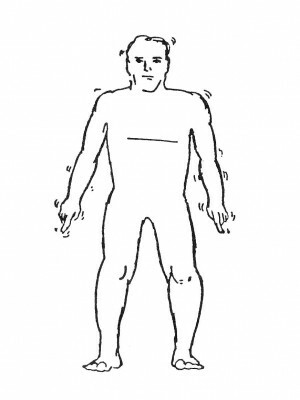 There are 12 movements, ten of which involve shaking in different positions. The exercises were kept secret and passed down in families for generations. Master Chih-Tung Chang made it public in Taiwan in 1976, and people who practiced the exercises reported healing from various ailments. The movements also spread to Southeast Asia and Japan, and at one time, over 3 million people practiced it. In Waidangong, it is emphasized that 100 days of continual practice is needed for the initial transformation to take place. Healing from sickness and reversal of aging are the first two stages of response. It is best to learn the exercises from a qualified teacher. Here, I would like to share the first movement which activates the shaking and is the foundation for all the other Waidangong movements. People have reported healing from stroke, cancer and nerve damage from just this one exercise. Stand with feet shoulder width apart, eyes softly gazing at the distance. Arms hang on the side in a relaxed way. Knees are relaxed, slightly bent. Raise the index fingers up and wait for the tremor. If the micro-movements do not come at first, one can shake the arms up and down, moving the shoulders. Eventually the movement will come by itself. Start with five minutes and build up to 30 minutes. Afterwards, avoid touching water or drinking cold water for at least 30 minutes. Women during the first three months of pregnancy and during the menstrual cycle should avoid doing this exercise. One can also induce shaking with the feet. Sit, stand or lie down. Flex the foot at the ankle up and down nine times. Relax and let the tremor start. Shake as long as one is able. Do one foot at a time. The foot is where the kidney energy channel starts and this is very good for energizing the kidney energy. Emotions often are released during the shaking. One can stop the shaking anytime if the emotions are too overwhelming. Once the blocked emotions are released, one feels relaxed and joyful. One can even induce the shaking by flexing the fingers nine times. Once the shaking starts, the movements will have their own pattern depending on the individual. Sometimes the movements are abrupt and strong, sometimes very subtle and fine. Given the level of stress in modern living, doing these exercises will keep one relaxed and happy. For more information on Waidangong, one can go to www.chi-research.org. Dr. Lai Chiu-Nan obtained her doctoral degree in chemistry from the Massachusetts Institute of Technology. After working with the MD Anderson Cancer Center, University of Texas for 10 years, she realized the limitations of the modern Western medical approach to cancer and began to study East-West models of healing. In 1991, she founded Lapis Lazuli Light, a holistic health education and information center in the United States. Currently, there are centers in Singapore, Malaysia, Taiwan, Australia, New Zealand and the United States.